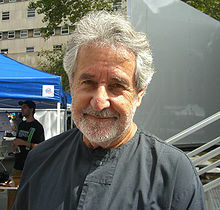 Breyten Breytenbach (; born 16 September 1939) is a South African writer and painter known for his opposition to apartheid, and consequent imprisonment by the South African government. He is informally considered as the national poet laureate by Afrikaans-speaking South Africans of the region. He also holds French citizenship. The goal, I submit, is obvious: subjugating the world (which is barbarian, dangerous, envious and ungrateful) to US power for the sake of America's interests. In reality the workings of your governing system are opaque and covert, while hiding in the chattering spotlight of an ostensible transparency, even though the ultimate objective is clear. It would be a tragic mistake for us out here to imagine that Bush represents the hearts and the minds of the majority of your countrymen. Many of your black and other compatriots must be just as anguished as we are. I think it's an area that one writes from that is curious because it is not a clearly defined partisan one. Better still - your history has shown how powerful a moral catharsis expressed through popular resistance to injustice can sometimes be; I have in mind the grassroots opposition to the Vietnam War. The predominant yardstick of your government is not human rights but national interests. Dangerous because your present Administration and its specialized agencies by all accounts know no restraint in hitting out at any perceived enemy of America, and nobody or nothing can protect one from their vindictiveness.